After a year that included a history-making single that spent 6 weeks at No. 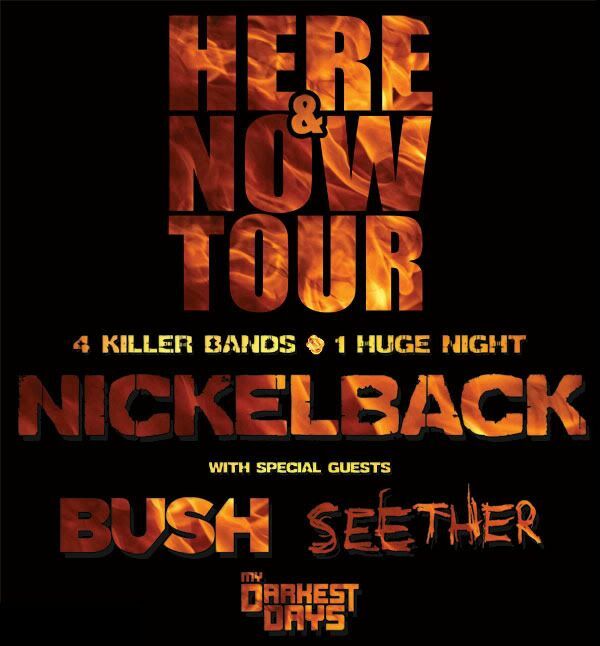 1 and a sold-out international tour, multi-platinum rock band BUSH are starting 2012 on a high note by announcing an arena tour of North America as special guests of Nickelback along with Seether and My Darkest Days. The much-buzzed-about road show includes Seether and My Darkest Days will kick off April 10 at the i wireless Center in Moline, IL. Tickets go on sale beginning January 20th at Ticketmaster.com and LiveNation.com. Bush’s set list will include an electrifying mix of classic hits and brand-new songs from their acclaimed comeback album, THE SEA OF MEMORIES, including new single “Baby Come Home.” On Sunday, January 15, Bush will shoot a companion video for the song in Los Angeles with director Todd Stefani. Stefani shot the video for Bush’s stunning cover of Fleetwood Mac’s “Landslide,” which can be seen HERE.